In May 2004, Adelphi University retained Counsilman Hunsaker to evaluate their existing 76-year-old pool at Adelphi Aquatic Center. The purpose of the facility evaluation was to determine the current lifecycle of the facility and provide options for extending the use of the facility. Areas of study included the pool finishes, recirculating system, piping, fittings, valves, filtration system, overflow recovery system, water chemistry treatment system, pump, flow meters, gauges, and controls, etc. 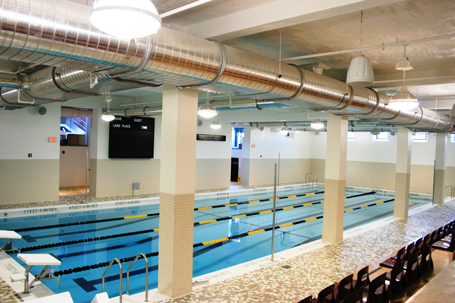 In February 2006, the team of Counsilman-Hunsaker and Cannon Design were retained by the university to provide renovations to the pool which included upgrading the mechanical systems and pool systems to meet current health code requirements. Also included is the reconstruction of the pool shell for an addition of a main drain and new piping. The pool mechanical equipment for the existing pool was also completely replaced to add a new start-of-the-art filtration and UV supplemental sanitization system to meet the needs of the large bather capacity of the facility.